The 7 Best Language Learning Software of 2018: The Awards! In the modern age of language learning, software is your friend. The thing is, there are so many different aspects of a language which you need to learn in order to master it. That’s why we’ve compiled a list of applications which you can use to train and improve different aspects of your learning. Choosing the right software for the right task is the first step to making the progress you’re looking for! We’ve picked 7 tools which we’ll talk cover throughout this article. We’ll explain what the tools do, what they’re like to use, and how they can best benefit your improvement. There are some classics and some new tools, some big concepts and some simple ideas, some free and some paid, but each and every one of them can offer something to most users. You might notice, we’ve left a few big names off the list. And, it’s worth mentioning, that though we haven’t included it in this list, we’ve nothing against Rosetta Stone. Just, as language learning software goes, we reckon there are others which can offer the same services better and for less money. We still like you, Rosetta Stone. We just don’t love you. I’m sorry we had to do this in public. Check out this 2 minute Saturday Night Live video on Rosetta Stone, if you get chance. When it comes to free language learning software, we had a fairly easy choice on our hands. To win this category, we were looking for a product which provides the maximum value to a user for the low low price of zero dollars. The choice, in the end, was obvious: Duolingo. 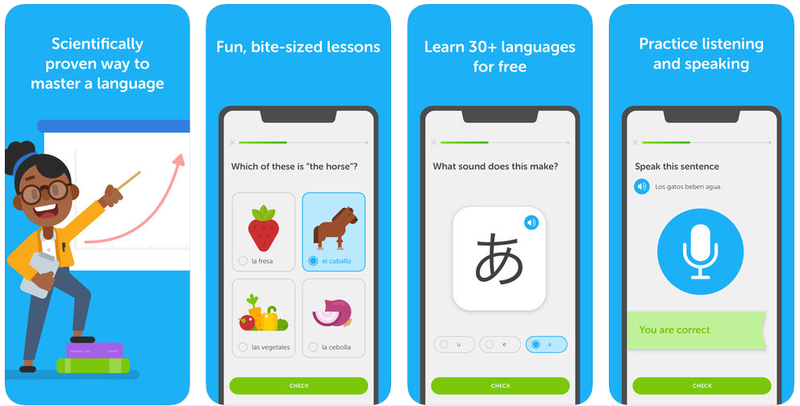 Duolingo has taken the world by storm and is consistently the top language learning mobile app across both iOS and Android, and its online offering is brilliant too. The fact it is available across all platforms without seemingly losing any of its effectiveness is testament to the beautifully simple nature of its core concept and the streamlined user-friendly design they’ve opted for. Duolingo provides learning materials across so many languages that it’s probably easier to pick out which languages it doesn’t have courses for. The library of courses it has is largest if you’re an English speaker, but recent years have seen the addition of so many courses from one language to another that it really is a truly global language learning software. It’s even possible to learn fictional geek languages through the platform, allowing you to brush up on constructed languages from your favourite fiction series, like Klingon. Where Duolingo excels is the initial stages of learning a language. If you’re going to start learning a new language from scratch, I would really recommend taking the Duolingo course for that language. You will start off with the most simple words and phrases, learning to associate them visually with images, to connect them with their equivalent terms in your language, and getting used to hearing them. This multifaceted approach provides a learner with multiple ways to interact with the new knowledge. As the course expands, you’re presented with grammar, more vocabulary, and harder listening exercises. The difficulty and breadth of the course materials increases as you go along, taking you to a point where you can feel confident interacting with the language you’re learning in its simple forms. As you become advanced in the Duolingo course, you’ll be presented with increasingly difficult translations to perform. These translations are actually one of the key ways the platform has been funded in the past, though in recent years the most complex translations - through the Immersion feature - have been stopped as it wasn’t bringing as much money as hoped. Nonetheless, it is testament to the effectiveness of the Duolingo approach that its learners were translating articles for Buzzfeed, CNN, Wikipedia and more. Duolingo is a great tool for getting the basics of a language and giving yourself a solid foundation from which to approach mastery. Sometimes the content can feel strange or not wildly useful, but if you have the commitment to complete the course then you’ll be able to partake in simple conversations with native speakers without too much difficulty, and will definitely be able to make sense of newspaper articles in your target language, even if you stumble over some bits. The gamified nature of Duolingo’s platform is a valuable addition to your learning toolkit as it’s easy to be sucked in an to lose an hour just going through the exercises. It makes learning fun and engaging rather than boring. Every language learner knows how valuable fun-learning is - commitment is often the hardest part of the language learning process. Once you’ve completed courses on Duolingo, or on a range of the other language learning software we’ve listed here, you should find that you’re ready for simple conversations. At this point, software becomes a little less useful as the nuances and complexities of language are vast. It’s here where you’ll likely want to start interacting with native speakers of the language. When it comes to language exchange, we’re biased but we believe the best way to learn Spanish, for example, is by meeting with a real Spanish speaker. There are many opportunities to meet digitally with other learners via text, voice, or video, and these can be really useful additions to your learning toolkit. In fact, Italki, mentioned further down the list, offers language exchange video chat services, and we recommend it for paid tutoring services. But it’s our belief that the most effective way - and the most fun way - is to meet with learners in real life. Meeting in real life means you get to engage with the deeper details of a language more. You get to tie in accents (the Andalusian accent, for example), body language, and cadence. Spending time with someone socially allows you both to get in the flow of a language and experience it as it’s meant to be. Plus, you make a more valuable connection with people in real life. You don’t have to build language learning into your schedule if you’re bringing it neatly into your social life. You can go to a bar, a cafe, or the cinema to enjoy yourself and have conversation in the language you’re learning. The app which looks to facilitate this is Idyoma. You make your profile and then you can browse through other users nearby to find people you would like to meet with. You can message each other beforehand on the platform and you’ll be able to see things like whether you have shared interests on Facebook, shared friends, or other shared languages. Idyoma is free to download and available on both iOS and Android. Idyoma’s most useful if you’re in a city as there are more likely to be other users around you. But you can also use Idyoma if you are travelling so you can meet up with locals who can show you around and recommend good spots to eat, drink, or have fun! The design is clean and modern, with the app being easy to use and navigate. Though the app is free, there is an optional in-app purchase to verify yourself on the platform so that other users know you are who you say you are. When discussing Duolingo, we mentioned how easy it was to keep using because of the gamified nature of the designs. When someone describes a software as being gamified, they mean that a narrative has been created in order to motivate a user to keep using the software. This could through earning points and then being able to exchange those points for something else. Or it could be through having to achieve a high score in order to unlock the next set of challenges. There are a whole host of ways this could be achieved. Our winner for the best gamified language learning software is Memrise. 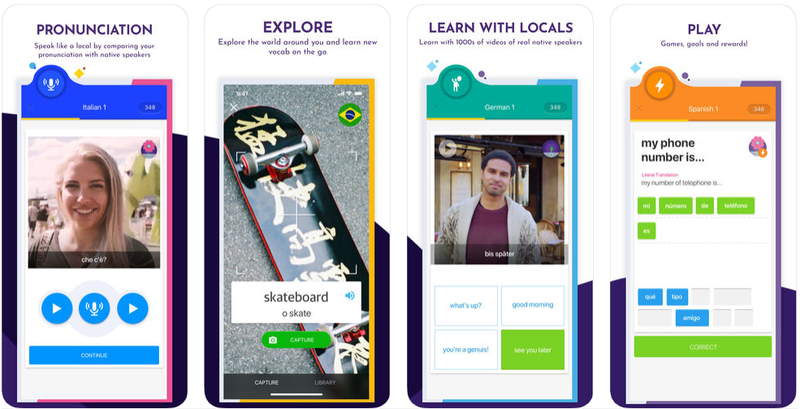 Memrise has fought off some pretty stiff competition to earn this prize, as a number of apps and webapps have put a lot of effort into cool new ways to interact with the learning process - not least, Mondly. But Memrise is our winner because it offers a huge range of languages to learn for free through its platform, while also having a host of really cool features included in its premium package. Memrise isn’t just a language learning tool which is game-like. On the mobile apps it can feel like a game with just happens to help with language learning. It’s best for vocabulary, in my opinion, but can also be really useful for grammar and basic conversational phrases. It performs a similar job to Duolingo in that it can take you from having no knowledge at all in a language to feeling like you want to go out and practice it with native speakers. Among Memrise’s premium package you’ll find some interesting features like chatbots, more game styles, and a large library of videos from native speakers. Through these kinds of features, Memrise has managed to make elements of language learning hugely dynamic while also tailoring for specifics like accents. Not many apps can compete with that! Memrise is an app we’ve used and we’d recommend any learner to give it a go! When it comes to the question of which piece of software is the best, you would normally look at what you can do with it or how it helps you; how the software provides a solution to a problem the user faces. While Mondly is a great tool for learning languages, and certainly solves problems, it also deserves a special mention for being a technically amazing bit of software. Many apps are just like interactive workbooks or fancy match-making tools, but Mondly is so much more than that. It’s a really comprehensive computer program with a wealth of complexity. Mondly has a virtual reality set up which allows you to have simulated conversations in a series of virtual settings. We love this inclusion of narrative into the product and into the language learning process, as narrative is a huge component of using a language in real life. Beyond this, Mondly also has many of the regular features you would hope to find in a piece of language learning software. It can function like an interactive workbook with question and answer scenarios, grammar tests, and whole load more. With Mondly, you can learn a new language from 33 different languages, which means it’s a great language resource for learners all over the world. As they rightly point out, most language learning resources start from English and this isn’t as useful for as many people. Interestingly, Mondly also have a kind of business product available designed to help businesses improve the language skills of their employees. If your work requires multilingual skills then you should consider pushing your boss into checking out what they offer. We’ve awarded Mondly our award for the best immersive language learning software mainly because of the VR component. This is a really useful feature which has the opportunity to be built out more and more in time. We definitely feel like Mondly is making a great contribution to the available software on the market. You probably already know about Babbel. Babbel is the world’s highest selling language learning application, second in raw downloads only to Duolingo. Much like Duolingo and a range of other apps, Babbel is kind of like an interactive workbook in that it will present you with little tests, missing words, or similar typical exercises. Where Babbel stands out is the way in which its courses are structured. Babbel courses are specifically designed to help facilitate conversations. It is, primarily, a conversational language learning tool. You can message through the app in a way which mimics a real conversation but includes exercises in the process, for example. You get to choose from a huge range of subject areas that you would like to learn to talk about. The conversational structure of these courses means that you don’t only learn to talk about things, but you also learn to listen and read; to comprehend properly the other side of the discussion. This selection of subjects is good for a few reasons. Partly, because it makes the lesson more relevant to you and your needs. It also makes the learning more enjoyable as you get to envision yourself using what you’re learning; seeing the practical use value in real time. And because it naturally breaks up the learning process into bitesize chunks. This helps you not get overwhelmed and lets you jump in and out of the learning as and when you have time to learn. These chunks are split into roughly 15 minute lessons. This means you can have a clear start and end point to a lesson while being able to factor in your available time. I used to use Babbel when I traveled to work. It would take me 25 minutes to travel, so I would use Babbel to do one lesson on each commute. The bitesize chunks made it easier for me to schedule time into my day to learn, and gave me a sense of accomplishment at the end of it. Something which had secondary benefits early on a Monday morning! When it comes to language tuition there are a whole myriad of ways you could approach it. Nearly every small town will have a language school of some sorts. A language school can be a great place to go to learn a new language and can be a great social experience in and of itself. But maybe you want to learn a language which is a little more unusual, or just not catered to where you live? Or, maybe you want to learn a language but can’t find the time in your day to travel to and from a language school, or its hours don’t fit in with your schedule? These scenarios, in particular, really shine a light on how useful Italki can be as a language learning platform. With Italki, you can register to receive 1 on 1 lessons with teachers all over the world. You could have a teacher who is a native in the language you want to learn. You could have a teacher who has a strong knowledge of your native language, if you’d prefer. Or, you could grab a community teacher who is happy to do conversational lessons with you at very affordable prices! There are so many use cases we could go through. With Italki you can find lessons at varying price points and at different levels of specialization. It’s a great platform for finding a tutor who can fit into your schedule. You simply arrange a time to video chat and you’re good to go. Italki also offers the opportunity to do language exchanges via video chat, if that’s something you’re into. When you’re learning vocabulary it’s always a good idea to strike a balance between association and repetition. This is largely how language learning software like Duolingo, Babbel, Rosetta Stone, Memrise, and countless others operate. However, often you may have a specific set of terms - or vocabulary - which you would like to study and learn. In the past, what you might do would be to write out the words you want to learn in a notebook with the translations next to them. Then you might sit and revise those words, trying to bury them deep inside your mind. Once you’ve done a stage of revision, you would attempt to write those terms out again on a blank page; seeing how many you can remember, seeing how many translations you can recall, and seeing how good your spelling is in your new language. This is a tried and tested method but, like so many other things, software has given us the opportunity to do it better than before. Quizlet lets you enter in a nice list of vocabulary which you want to learn, and allows you to craft your own activities relating to this list; to the different words. You can pretty much build your own basic Duolingo or Memrise course, albeit without the variance and advanced features. Nonetheless, Quizlet has to be considered my favorite tool for vocabulary learning, in particular. I used it when I was learning my Spanish verbs, specifically learning my -er, -ar, and -ir verbs in separate lists. I plan to use it again to learn more terminology related to football (soccer), which is something I love to talk about but don’t always have the right words in Spanish. But - and here’s where it gets even better - I didn’t have to build that course for myself. When you build a new course, or set as they’re called, you can choose whether it should be public or private. Public sets can then be used by anyone to help their learning. At the point of writing,Quizlet boasts over 270,000,000 community generated study sets. Which, let’s be honest, is a ridiculous volume of learning materials. Not all, of course, are language specific, as Quizlet is such a flexible piece of software that it is used by learners and teachers for learning vocabulary relevant to all different disciplines. This is why we’ve awarded Quizlet the title of our best vocabulary learning software! Find the best language learning software for your needs! A simple overview of the tools in this list and the ridiculous adverts in that video above, shows how much the language learning game has changed over time. Software has been a real force for advancing language learning and we’re really looking forward to seeing the extra steps which can be taken in the industry to move learning forward further. Of course, software isn’t the only thing you can use to help you learn languages. Check out our post on Spanish movies to give yourself some language learning resources you chill out to. What are your favorite tools for learning languages? Do you agree with our list of the best language learning software? Let us know in the comments below!